In sports and orthopedics, a tear of a meniscus is a rupturing of one or more of the fibrocartilage strips in the knee called menisci. When doctors and patients refer to “torn cartilage” in the knee, they actually may be referring to an injury to a meniscus at the top of one of the tibiae. Menisci can be torn during innocuous activities such as walking or squatting. They can also be torn by traumatic force encountered in sports or other forms of physical exertion. The traumatic action is most often a twisting movement at the knee while the leg is bent. In older adults, the meniscus can be damaged following prolonged ‘wear and tear’ called a degenerative tear. Tears can lead to pain and/or swelling of the knee joint. Especially acute injuries (typically in younger, more active patients) can lead to displaced tears which can cause mechanical symptoms such as clicking, catching, or locking during motion of the knee joint. The joint will be in pain when in use, but when there is no load, the pain goes away. elling. 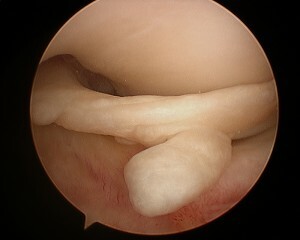 In meniscal tears, pressing on the joint line on the affected side typically produces tenderness. The McMurray test involves pressing on the joint line while stressing the meniscus (using flexion–extension movements and varus or valgus stress). Similar tests are the Steinmann test (with the patient sitting) and the Apley grind test (a grinding maneuver while the person lies prone and the knee is bent 90°). Bending the knee (into hyperflexion if tolerable), and especially squatting, is typically a painful maneuver if the meniscus is torn. The range of motion of the joint is often restricted. The Cooper’s sign is present in over 92% of tears. It is a subjective symptom of pain in the affected knee when turning over in bed at night. Osteoarthritic pain is present with weightbearing, but the meniscal tear causes pain with a twisting motion of the knee as the meniscal fragment gets pinched, and the capsular attachment gets stretched causing the complaint of pain. ne cartilage, the menisci are made of tough fibrocartilage and conform to the surfaces of the bones they rest on. One meniscus rests on the medial tibial plateau; this is the medial meniscus. The other meniscus rests on the lateral tibial plateau; this is the lateral meniscus. niscus, as the avascular areas tend not to heal. Without the essential nutrients supplied by blood vessels, healing cannot take place. Degenerative tears are most common in people from age 40 upward but can be found at any age, especially with obesity. Degenerative meniscal tears are thought to occur as part of the aging process when the collagen fibers within the meniscus start to break down and lend less support to the structure of the meniscus. Degenerative tears are usually horizontal, producing both an upper and a lower segment of the meniscus. These segments do not usually move out of place and are therefore less likely to produce mechanical symptoms of catching or locking. joint locking, or the inability to completely straighten the joint. This is due to a piece of the torn cartilage preventing the normal functioning of the knee joint.